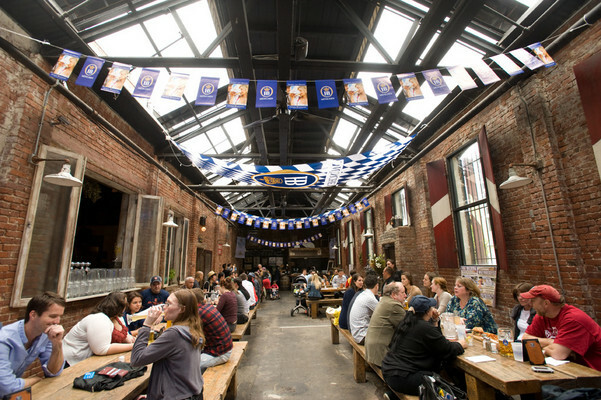 Last weekend we found ourselves at the Radegast Hall and Biergarten in Williamsburg. We wanted to start off the night with some large liters full of beer and food hot of their grill. The biergarten has the classic beer hall feel with large wooden tables and tall ceilings. The waitresses all wear your standard bier maiden outfits, which add to the atmosphere. All of this coupled with the huge liters full of authentic German beer makes it feel as if you are in Germany celebrating at Octoberfest. Radegast offers two types of menus to order from, the main menu and the grill menu. The main menu offers more formal dishes featuring German classics such as a Munich Pretzel or Veal Schnitzel. The grill menu on the other hand provides less formal options such as sausages, burgers and fries all cooked on the open grill in the back of the hall. The beauty of the grill is that it sends out this amazing aroma of grilled meat into the hall that is almost impossible to resist. We started with the Munich Pretzel that is baked in house to order. This pretzel has a nice crisp outside with a warm soft inside and it is seasoned with the perfect amount of salt. It is all too often that pretzels get over salted because the dough is just not that good. The good thing for us is here at Radegast they know what they are doing when it comes to making pretzels. They serve the pretzels with a house made spicy mustard and Cornichon pickles. The mustard has a great kick to it and pairs perfectly with the pretzel. The pickles are tart with and have a nice amount of snap to them when bitten into. There is no better appetizer while drinking dark German beers than one of these pretzels. We followed up our pretzel with a selection from the grill. We ordered the grilled bratwurst served on a Pretzel Roll with sauerkraut. Yes that's right we added more pretzel to our meal. When the chef suggests adding the pretzel roll to your meal you do not ask questions you just say yes. 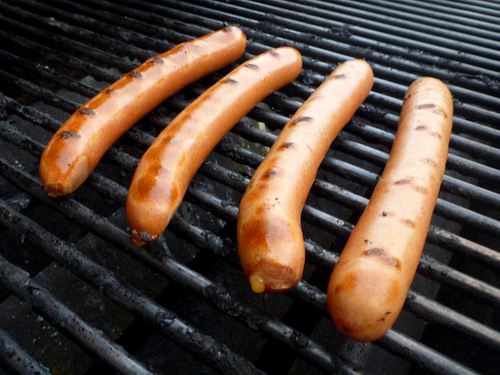 Our bratwurst was cooked in front of our eyes and had that freshly grilled look to it, nice and crispy. It was then placed on the bun and topped with a healthy serving of sauerkraut. 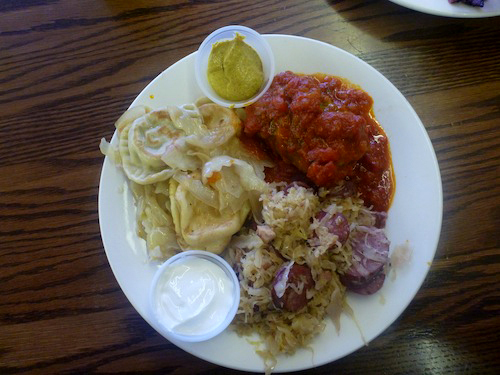 The sauerkraut was sweeter that you might expect, we think it is due to the addition of carrots in the cabbage. 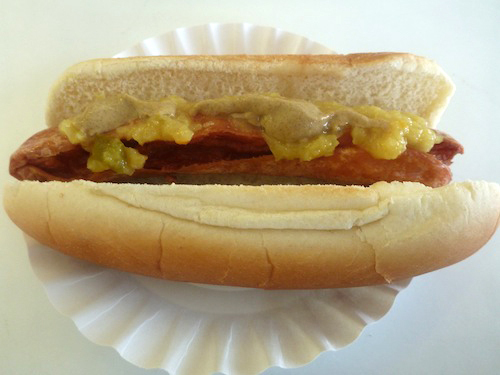 It did however add a nice counterpoint in flavor to the saltiness of the brat. We then topped all of this off with a bit of the German mustard for the final touch to the meal. To go along with the brat, we ordered some fries. The thing about the fries at Radegast is they are very addicting. They are fried to a golden crisp and seasoned well with just the right amount of salt. 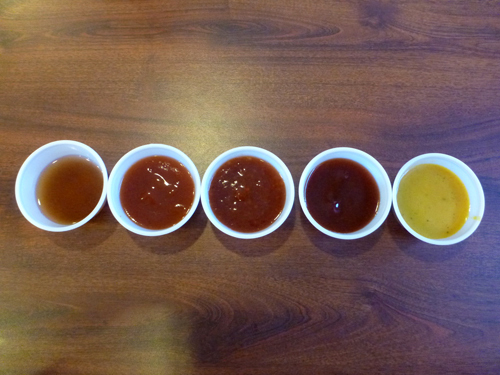 We dipped these things in just about every mustard option they had available. The best was either the spicy mustard or the German mustard. We could not get enough fries and even ordered more to go with our beers later in the night. Radegast is easily a Should Eat. 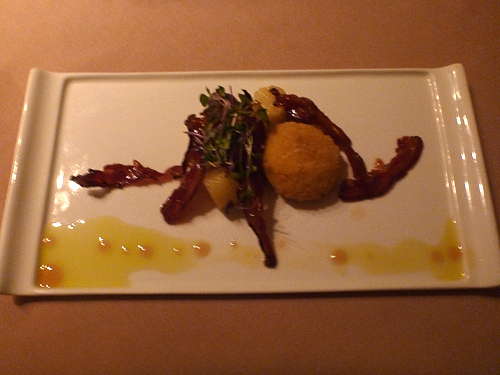 They offer everything needed for a good night out on the town, good atmosphere, good food and good drinks. There may be more than a handful of similar places in Brooklyn, but Radegast is the total package. Check out Radegast for the food and stay for the drinks. All of this spumoni talk may have you confused, especially if you do not know what spumoni is. Spumoni is an Italian dessert made up of layers of molded ice cream. Traditionally flavors include cherry, pistachio chocolate and vanilla. In 1939, Ludovico, Sr. decided he needed a place to make his Spumoni and bought a plot of land in Brooklyn and built their first building to be their factory. People began to line up at the factory to get spumoni and that is when they realized they would need to build a sit down area for customers.In the mid 1950's L & B Spumoni Gardens built the second building, which is now the Pizzeria. 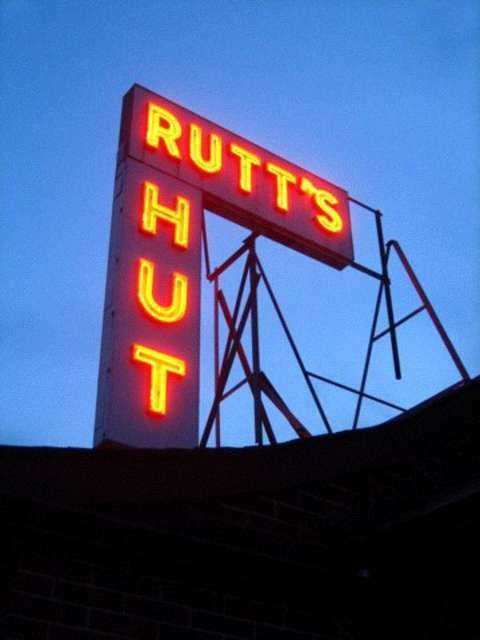 Then progressively, though the years the third building was added, it became their luncheonette. When you go to Spumoni today you can still see the 3 different buildings that comprise L & B Spumoni Gardens. While they have tons of things to offer, we went to Spumoni to get some of their famous Sicilian style pizza. The beauty of Spumoni Gardens is how basic the pizza menu is. Pizza is the only thing they sell in this section of Spumoni Gardens is, so orders go quickly. 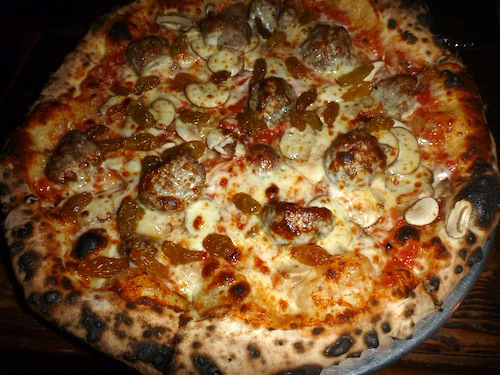 You can order slices or whole pies but you will have to choose between traditional round pizza or their famous Sicilian. We have never gotten the traditional slice but we hear it is very good. For us if you are going to Spumoni Gardens the only thing you can buy is the Sicilian pizza. You may think one or two slices of Sicilian pizza will be enough for you, but trust us you will want more. We are not even sure words can do this pizza justice, but we will try. Pizza is a simple meal consisting of three main things dough, sauce and cheese. You start with the dough, add the sauce and then top it all with cheese. Here at Spumoni they change those rules a bit. They start with the dough, then add the mozzarella and top it off with tomato sauce and a sprinkling of Pecorino Romano cheese. It is this method that sets their Sicilian slice apart from any that we have ever had. Adding the layer of cheese before the sauce is a game changer. 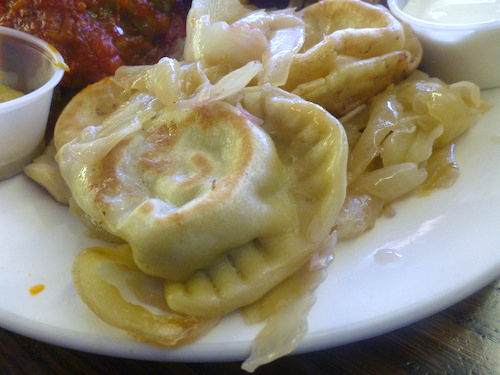 It creates a layer of protection for the dough keeping the sauce from soaking in. It also adds this amazing texture in the middle of the pizza, which creates one of the four layers that makes this pizza so good. The first layer of goodness is the sauce. Made from San Marzano tomatoes, the sauce is naturally sweet and made fresh. Next comes the cheese which we have already mentioned above. The third layer is the soft airy dough in between the cheese and crust. 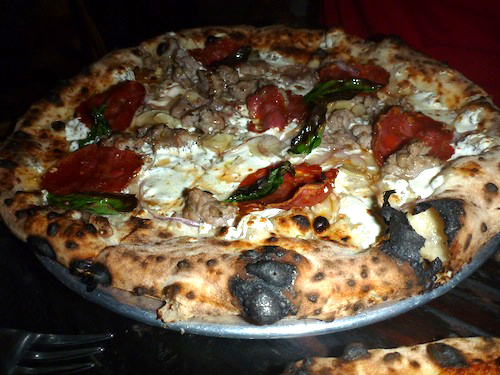 The dough has great flavor and is not as dense as many other Sicilian pizzas. 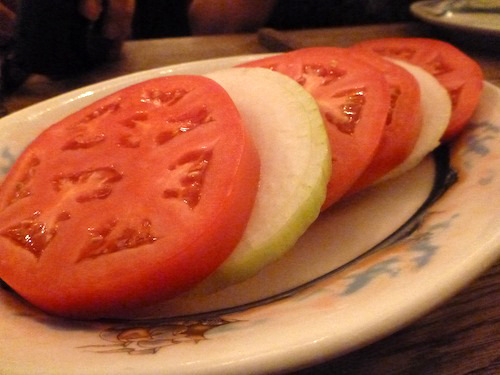 Here it is very light which allows you to eat as many slices as you like. The final layer is the crispy layer on the bottom of the pizza thanks to the tray. It creates this crispy golden brown crust that gives the slices enough support to be picked up. Every other layer in this pizza is very soft so the bottom layer helps to bring in that needed crunch. When these four layers come together in each bite it is just so good. Our favorite part is the gooey center created by the cheese and dough. It provides a unique texture and gives the pizza a unique sensation when bitten into. Everything about this pizza is so good that you can't resist eating slice after slice. When we go now we don't even bother order 2 or 3 slices we just order a half or full sheet. We may not eat it all there but leftovers are no problem. You will be surprised at how many slices you can eat. This pizza also reheats perfectly losing none of its glory in the fridge, which is why the leftovers do not last very long. You may however find that this pizza is amazing cold also. No matter how you like your pizza, spumoni will not disappoint. L & B Spumoni Gardens is a Should Eat. It is the best Sicilian slice of pizza you will ever have, we promise. It is worth the drive and the wait any time of year. Some quick tips when eating at Spumoni, have part of your group secure a table while the other half orders the pizza. Order more slices than you expect to eat, you will thank us. Get napkins it can get messy especially when eating the middle slices with no crust. 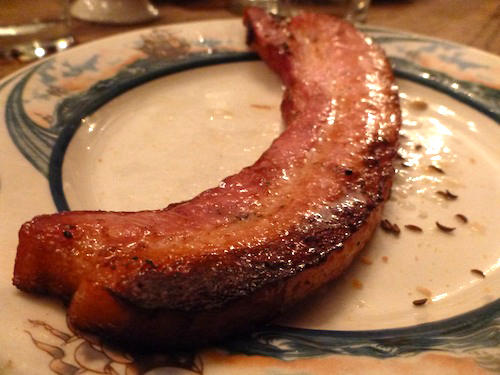 Mable's Smokehouse opened up in Brooklyn a little over a year ago. 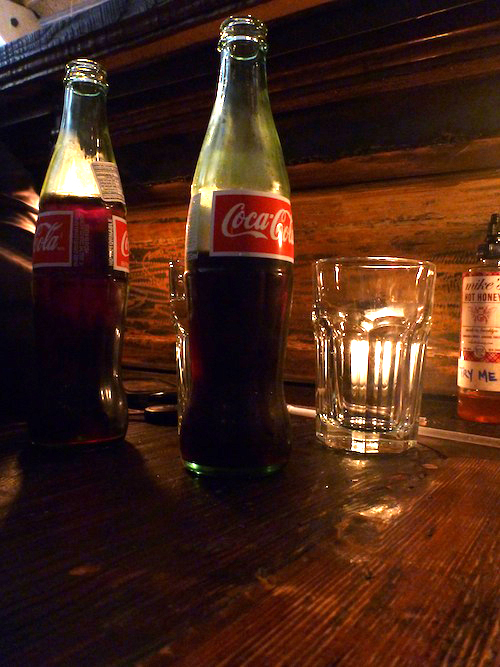 Since their opening they have quickly become one of our favorite places to drink in Brooklyn. They are also home to some of the best BBQ we have eaten. 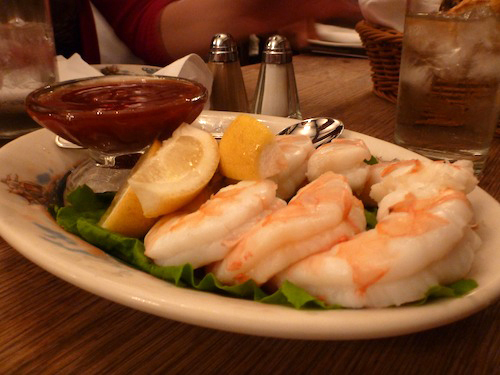 Mable's has a very relaxed atmosphere with cafeteria style seating and a nice sized bar. The decor helps transport you from NYC to some roadside BBQ joint in Oklahoma. We can't forget to mention the great tunes that put you in the mood to grab a stool and throw back a couple of Lone Stars. After inhaling the sweet smoky aroma of wood and smoked meat you can't help but place an order. 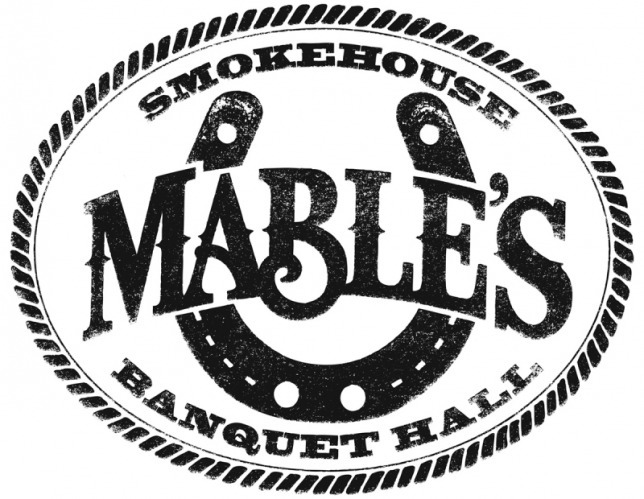 Mable's has a basic menu which features Pulled Pork, Beef Brisket and St. Louis Style Ribs. For you vegetarians out there they also offer a vegetarian Sloppy Joe. The pulled pork and brisket can be ordered on a sandwich with 1 side or as a platter with 2 sides. The ribs come as a platter with 2 sides. For the sides you can choose from BBQ Baked Beans, Cole Slaw, Bet’s Best Potato Salad, Collard Greens, Creamy Mac n' Cheese, Borracho Beans or Candied Yams. Mable's recipes come from co-owner Jeff Lutonsky’s Oklahoman mother and grandmother (Mable herself). These ladies were on to something because this food is delicious. The brisket platter was piled high with about 7 slices of perfectly cooked brisket. It was fork tender and had a nice bark thanks to a generous application of dry rub. The bark is a BBQ term which refers to the surface of the brisket after it has been cooked. You will also notice the coveted smoke ring right below the bark of the brisket. The smoke ring refers to the pink ring that is below the bark of the brisket, these are both qualities that any true BBQ connoisseur will look for. Topping the brisket is Mable's secret BBQ Sauce. This is a sweet style BBQ sauce that has a nice lip smacking tang to it. This sauce is so good you will find yourself putting it on just about everything. To go with our brisket we ordered candied yams and Mac n' Cheese. The candied yams were soaking in a sauce consisting of butter and brown sugar. 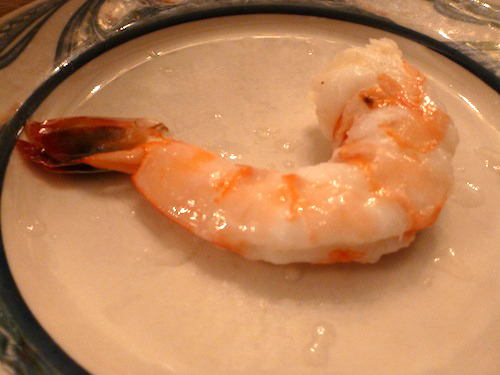 This sweetness helped to provide a nice contrast from the savory flavor of the meat. The yams were cooked to the right consistency and reminded us of Thanksgiving dinner. The Mac n' Cheese was nothing fancy, which is why it is so good. Mable's is not trying to wow you with 5 different types of cheese you can't pronounce, let alone ever heard of. It has a nice creamy texture and reminds us of the Mac n' Cheese we grew up with, even if it was right out of a box. 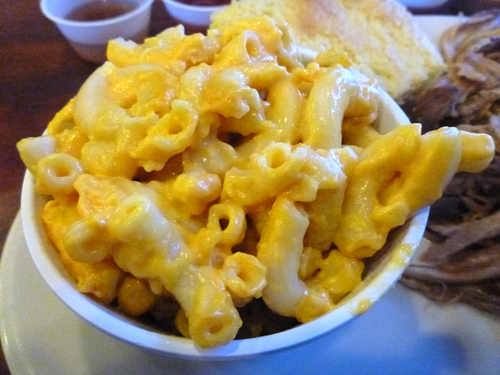 Like we said earlier their BBQ sauce could go on everything, well we added it on top of our Mac n' Cheese. It sounds like an unusual pairing, but it just works and we suggest giving it a try. Also served with the platter are some slices of Wonder Bread, Homemade Cole Slaw and a batch of pickles, onions and jalapenos that were all pickled together. We especially like the pickles and jalapenos that add a nice spice to the meal.